Venture out of the city with trips to Fremantle Prison (in Fremantle) and Caversham Wildlife Park (in Whiteman). Dedicate the 19th (Mon) to wine at some of the top wineries in the area. On the 21st (Wed), give your taste buds a day to remember with a local gastronomic tour. 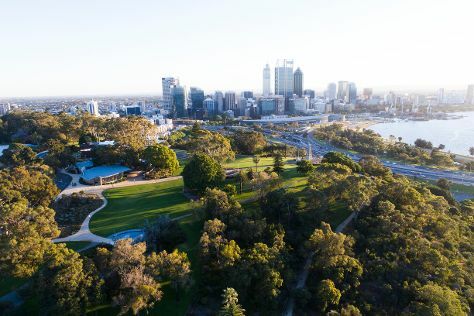 There's still lots to do: admire the natural beauty at Kings Park & Botanic Garden, get engrossed in the history at Revolutions Transport Museum, pause for some photo ops at Kings Park War Memorial, and contemplate the long history of The Perth Mint. To see more things to do, where to stay, other places to visit, and more tourist information, read Perth vacation builder site . London, UK to Perth is an approximately 20-hour flight. Due to the time zone difference, you'll lose 8 hours traveling from London to Perth. Traveling from London in August, things will get little chillier in Perth: highs are around 22°C and lows about 9°C. Finish your sightseeing early on the 21st (Wed) so you can travel to North Stradbroke Island. Spend the 23rd (Fri) exploring nature at Blue Lake National Park. For more things to do, where to stay, maps, and more tourist information, you can read our North Stradbroke Island travel route planner. Explore your travel options from Perth to North Stradbroke Island with the Route module. The time zone difference moving from Australian Western Standard Time to Australian Eastern Standard Time (Queensland) is 2 hours. In August, daily temperatures in North Stradbroke Island can reach 25°C, while at night they dip to 11°C. Wrap up your sightseeing on the 24th (Sat) to allow time to travel to Loganholme. Start off your visit on the 25th (Sun): take in nature's colorful creations at Redlands Indigiscapes Centre, walk around Victoria Point Reserve, and then look for gifts at Poppy's Chocolate Factory. On the 26th (Mon), you'll have a packed day of sightseeing: walk around Underwood Park, then have some family-friendly fun at TankRide, and then brush up on your knowledge of spirits at Beenleigh Artisan Distillery. To find traveler tips, reviews, where to stay, and tourist information, read our Loganholme travel tool . Traveling by car from North Stradbroke Island to Loganholme takes 3 hours. Expect a daytime high around 26°C in August, and nighttime lows around 10°C. Finish up your sightseeing early on the 26th (Mon) so you can travel to Lamington National Park. Explore the numerous day-trip ideas around Lamington National Park: Tweed Regional Gallery & Margaret Olley Art Centre (in Murwillumbah), Buck's Farm (in Chillingham) and Mount Warning Summit Trail (in Mount Warning). Spend the 29th (Thu) exploring nature at Lamington National Park. To find photos, maps, and tourist information, use the Lamington National Park day trip website . You can drive from Loganholme to Lamington National Park in 2 hours. August in Lamington National Park sees daily highs of 25°C and lows of 11°C at night. Finish up your sightseeing early on the 29th (Thu) so you can go by car to Brisbane. Get out of town with these interesting Brisbane side-trips: Australia Zoo (in Beerwah), Warner Bros. Movie World (in Oxenford) and Sea World Theme Park (in Main Beach). Next up on the itinerary: let the kids burn off some steam at South Bank Parklands, take in nature's colorful creations at Roma Street Parkland, look for all kinds of wild species at Lone Pine Koala Sanctuary, and stroll through Surfers Paradise Beach. 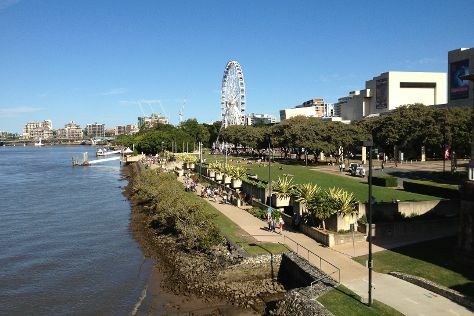 To see reviews, more things to do, where to stay, and more tourist information, you can read our Brisbane trip itinerary maker . Traveling by car from Lamington National Park to Brisbane takes 2.5 hours. In August, daily temperatures in Brisbane can reach 25°C, while at night they dip to 11°C. Wrap up your sightseeing by early afternoon on the 5th (Thu) to allow enough time to travel back home.